The franchise operated all its services to and through Manchester covering three main routes. The service provided rail links for major towns and cities such as Edinburgh, Glasgow, Liverpool, Sheffield, Hull, Leeds, York, Scarborough, Middlesbrough and Newcastle. 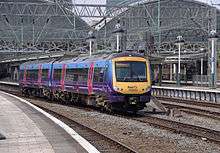 Previously, all services called or terminated at Manchester Piccadilly, but, as of May 2014, a new service running between Newcastle Central and Liverpool Lime Street, calling at Manchester Victoria was announced, and launched as part of the Northern Hub plan. TransPennine North West used sections of the Styal Line, Manchester to Preston Line, West Coast Main Line, Furness Line and Windermere Branch Line. 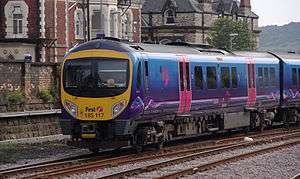 These services were formerly operated by First North Western with the exception of the Scottish routes, which were previously operated by Virgin Trains from Manchester Piccadilly. Despite the 185s having a higher capacity than two-car 158s, 185s frequently leave passengers behind due to severe overcrowding at peak times. Transport for Greater Manchester stated in 2007 that projected passenger numbers would probably mean that 100–125 mph (161–201 km/h) 8-car units would be needed by 2014. ↑ "New franchising programme" (Press release). Department for Transport. 5 August 2011. ↑ "Rail Franchising: Written evidence from First/Keolis TransPennine". UK Parliament. 5 February 2013. Retrieved 16 March 2013. ↑ "Research Project on Reviewing the Franchise Map" (PDF). Jacobs Consultancy. March 2011. Retrieved 16 March 2013. ↑ "Future of Northern and TransPennine Express rail franchises" (Press release). Department for Transport. 9 June 2014. ↑ "December Changes: Changes to services between Manchester, Bolton, Chorley, Preston and Cumbria / Scotland". First TransPennine Express. 2013. Retrieved 1 December 2013. ↑ "The Pennine Class 185 experience - What do passengers think?" (PDF) (Press release). Passenger Focus. May 2007. Retrieved 10 June 2008. More than 90% of passengers said they are satisfied with the key measures – getting a seat, the ease of getting on and off the train and cleanliness of the train interior. ... However, the research also shows that passenger satisfaction with comfort decreases as the journey time increases. ↑ Emma Davison (31 October 2008). "Anyone for a game of train sardines?". Huddersfield Daily Examiner. ↑ "Heavy Rail White Paper" (PDF). Greater Manchester Passenger Transport Authority. ↑ West Coast Main Line route utilisation strategy, Network Rail. ↑ "Britain's Transport Infrastructure: Rail Electrification" (PDF). Department for Transport. July 2009. ↑ "Rail passengers in the north of England and Scotland to benefit from new trains" (Press release). First TransPennine Express. 29 February 2012. 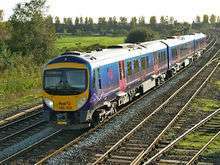 ↑ "Campaigners' fury as nine TransPennine Express trains sent south in 'crazy and scandalous' move". Manchester Evening News. 3 March 2014. Archived from the original on 12 March 2014. ↑ "Train Announcement". First TransPennine Express. Retrieved 9 January 2015. ↑ Prentice, Paul (8 January 2015). "Locomotive-hauled trains to return to north west". Rail Magazine. Retrieved 9 January 2015.